Crowdfunding, the practice of funding a project by raising small amounts of money from a large number of people, has become a popular way for inventors, small businesses, artists, and nonprofits to fund their projects and causes. In 2017 alone, over $601 million was raised on Kickstarter, one of the largest fundraising platforms in the world. It takes most nonprofits around two weeks to research and prepare a crowdfunding campaign. This includes finding the best crowdfunding site for their organization, looking at similar campaigns to see what was successful (or unsuccessful), determining how long the campaign should run, and much more. It might be tempting to put a campaign together in a day or two so you can start raising money as quickly as possible, but taking the time to carefully plan your campaign will pay off. This is part of preparing your campaign but it’s worth mentioning on its own. Choosing the right crowdfunding site is key. Kickstarter is great for artists and inventors, but it’s not ideal for nonprofits. Luckily, there are several crowdfunding sites that cater to charities and nonprofit organizations. You may have to look at a few to find the best one for your organization, but being on a platform made for nonprofits is one more thing you can do to ensure your campaign succeeds. While you may want or need to raise money for your whole organization, crowdfunding works best when you raise funds for one specific project or cause. Choose one project you’d like to complete, one item your organization needs to purchase, or one event that needs to be funded and make that the focus of your campaign. Part of properly preparing your campaign is setting SMART goals. SMART is an acronym for specific, measurable, attainable, realistic, and timely. Having these goals clearly defined will help you know exactly what you need to work toward to ensure your campaign is successful. You should personalize your crowdfunding campaign page to tell your organization’s story and help your campaign stand out. Inject personality into it, share photos and videos, and make it yours! Your page should accurately portray your campaign to make sure potential donors understand your cause right away. As your campaign progresses, update the page to let donors and potential supporters know how far you’ve come and how far you have to go. Incentives for donors are a great way to encourage donations and engagement. This may not work for every campaign or every organization, but events like exhibitions, 5Ks, and walkathons are perfect for incentives. They don’t have to be big or expensive. You might be surprised at how motivated people are by small things like stickers with your organization’s logo, tickets to an event, or shoutouts on social media! This is a no brainer. People can’t donate to your campaign if they don’t know about it! Spread the word via email, social media, and word of mouth. If your crowdfunding site uses any sharing widgets or provides graphics to help you promote your campaign, be sure to use them! You can also print marketing materials to help promote your campaign. Most crowdfunding campaigns receive the bulk of their donations at the very beginning and very end of the campaign so it’s important to hit the ground running and keep promoting throughout the duration of the campaign. When the campaign is over, it’s important to follow through on any promises you made, including delivering incentives and, of course, remember to thank your donors. Even if you didn’t reach your goal, take the time to thank the people that supported you. Thank them with an email or, if you really want to make an impression, a handwritten thank you card. Don’t just let people know whether or not you reached your goal, but tell them where the money went and show the impact it had. Were you able to deliver books to after-school programs? Share photos and videos of the students enjoying their generosity to let everyone know that their donations really made a difference. 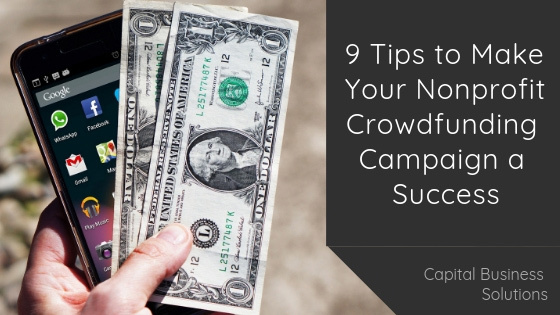 There are our 9 tips for creating a successful crowdfunding campaign for your non-profit! If you’ve had success crowdfunding for your non-profit, we want to hear what worked for you. Join the discussion on Twitter or Facebook.